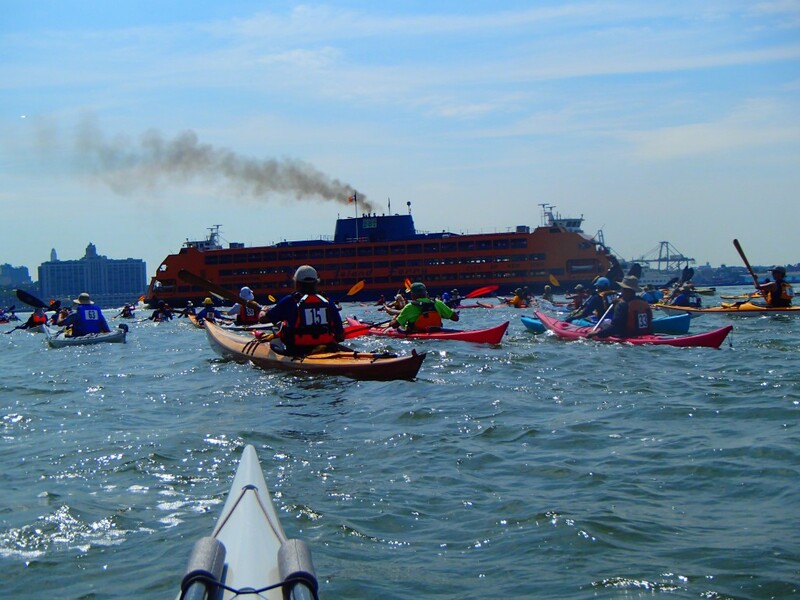 On July 27, Renee and I (Lynne) completed “Jerry & Steve’s Annual Manhattan Circumnavigation” (30 miles) with 68 kayakers. It took about 10 1/4 hours to complete, including breaks. From the launch, 7:15 AM, (Tubby Hook, Upper west side of Manhattan in the Inwood section) we paddled south on the Hudson on a strong ebb current. Once we got to the southern end of Manhattan, we had our first stop at Pier 40. Then, coordinating with ferry schedules, crossed the Battery and headed toward Brooklyn. 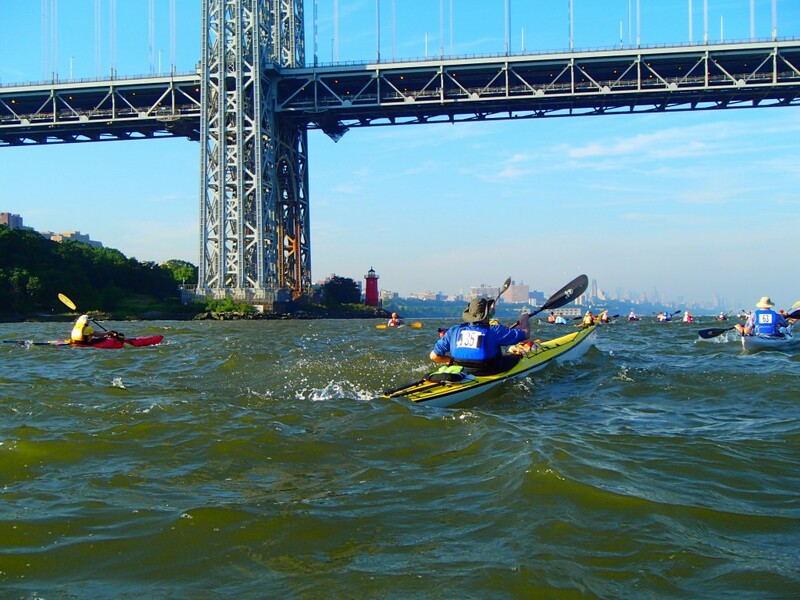 Paddled north on the East River–assisted by a strong flood current. Arrived at Hallet’s Cove Beach/Socrates Sculpture Park in Astoria, Queens, to have lunch and wait for slack tide before the ebb at Hell Gate. 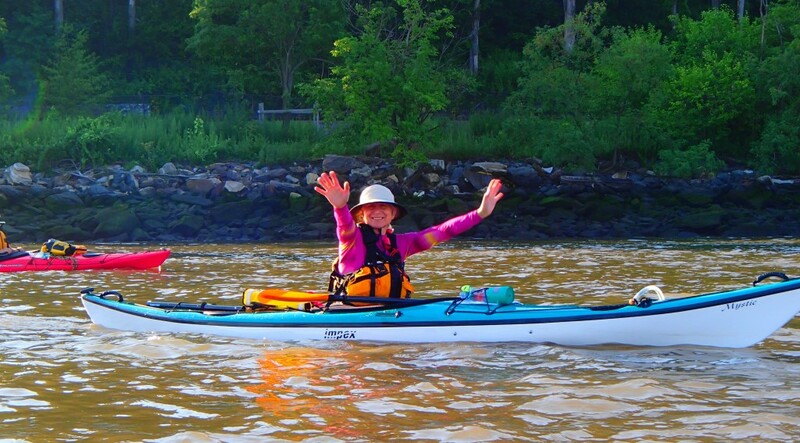 We crossed the East River at the northern tip of Roosevelt Island, then headed north on the west side of Mill Rock and paddled up the Harlem River as it ebbed north into the Hudson. Stopped for a final break at Peter Jay Sharp Boathouse/Swindler’s Cove. Continued north on the Harlem River through Spuyten Duyvil, which is at the northern end of Manhattan, and then back around to our put-in at Tubby Hook at 5:30 PM. It was an amazing trip and plan on doing it again next summer. Excellent, Excellent, Excellent! Absolutely fantastic. Great Job, Lynne! We are very proud of you. That was quite a challenge!